Historic sketches, watercolors and lithographs made of Montpelier during Madison’s ownership, as well as photos of the house taken after ca. 1880, clearly show shutters installed on the Mansion. The Dinsmore/Neilson carpentry bill also includes line items for shutters, confirming that the shutters shown in many of the historic images dated to ca. 1812. However, photos taken of the house after the duPont renovations in ca. 1901 reveal that the shutters had been removed and not replaced. Because the shutters were a major exterior architectural element, the Restoration Team would need to determine what the shutters looked like and how they were installed. A ca. 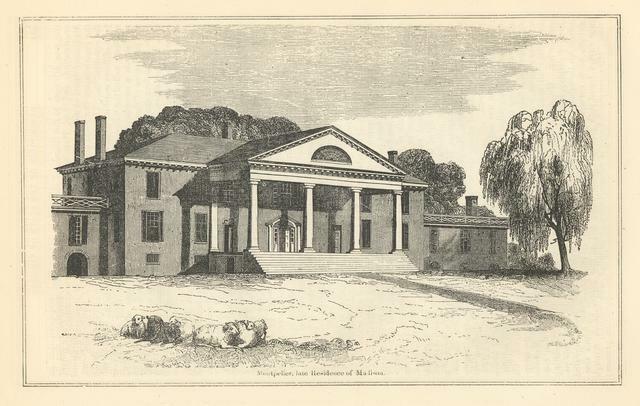 1835 engraving of Montpelier.